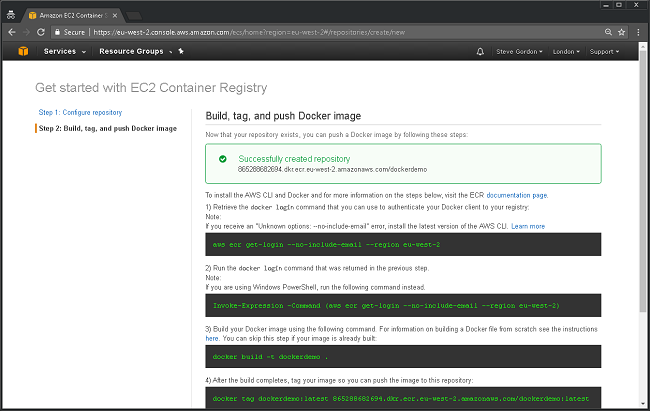 In the previous part of this series I have discussed the reasons behind our decision to use Docker to run our product in production, using it to build and deploy images onto Amazon ECS. The next parts of this series will focus in on how we have achieved that and demonstrate how you can set up a similar pipeline for your systems. We’ll look at how we run our builds inside Docker, via Jenkins and how we deploy those images into AWS. I’ll dive into some AWS ECS topics in these upcoming posts, discussing what it is and what it does in more detail. 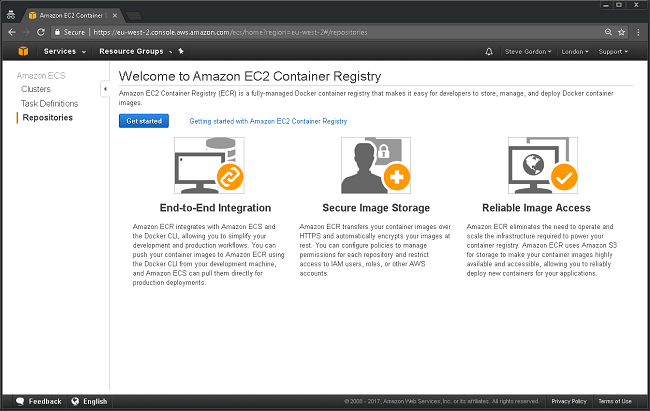 For now I want to start with one related part of ECS called the Amazon EC2 Container Registry (ECR). The reason I wanted to start with this is that I will soon be demonstrating our build process and a key part of that is pushing our images up to a registry. A container registry is ultimately just a store for images. For .NET developers, it’s quite a similar concept to Nuget. In the same way Nuget hosts packages, a registry hosts Docker images. As with Nuget, you can use a private registry, share your image publicly via a public registry or even host a local registry on your machine (inside Docker of course). Images inside a registry can be tagged so you can support a versioning system for your images. Microsoft use this technique for their aspnetcore images. While they share the same name, there are variants of the images tagged with different versions to indicate the version of the SDK or runtime they include. The main reason we need a registry is to allow other people or systems to access and pull our images. They’d not be much use otherwise! For our system we started with a private registry running on Amazon ECR. The main reason we chose ECR was the fact that we would also be using AWS ECS to host our production system. 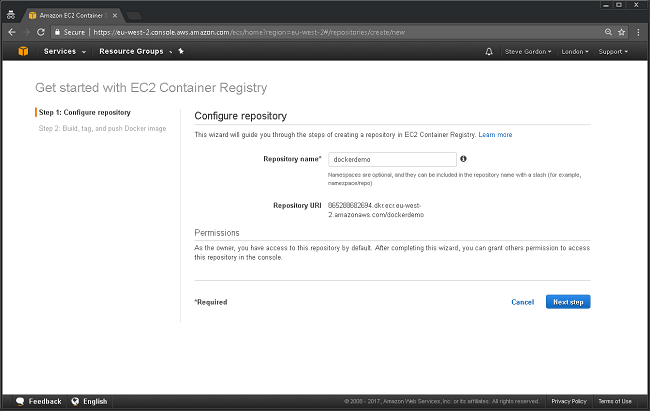 ECR is a managed container registry which allows storing, managing and deploying Docker images. 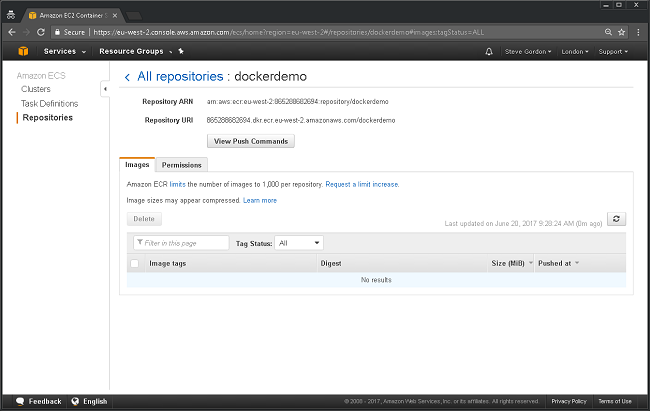 In this post I want to share the steps I used to setup a container repository in ECR. It’s a quite straightforward process and takes only a few minutes. If you want to follow along you can sign up for AWS and try out the steps. Currently ECR is free for the first 500MB of images stored in it so there should be no cost in following along. AWS ECR is a subset of the main ECS service so appears as repositories on the ECS menu. A Docker registry is the service that stores images, a repository refers to a collection of Docker images sharing the same name. If you’ve not use the service before you can click Get Started to create a new repository. You are guided through the process, following a setup wizard. The first thing you must provide is a name for the repository to help identify it. You can optionally include a namespace before the repository name which would allow you to have more control over the naming. For example, you may choose to have a dev/dockerdemo repository and a prod/dockerdemo repository. AWS will generate a unique URI for the repository which will be used when tagging images you want to push to it and for pulling images from it. As per the screenshot, permissions will be setup for you as the owner. You can provide more granular access to a registry later on. For example, your build server will need to use an account with push permissions, but developers may only need pull permissions. After clicking Next Step your registry will be created. At the next screen you will be shown sample commands you can use to deploy images into the registry. I won’t go into those for now since we’ll look at them properly when we explore our Jenkins build script. Continuing on, you are taken into the repository which will currently be empty. Once you start pushing images to this registry you will see details of the images appear. At this point you have an empty repository that can be used to store Docker images by pushing them to it. We’ll look at the process in future posts. While you can use the console to add repositories, you can also use the AWS CLI as well. You will first need to install the AWS CLI and configure it, providing a suitable access key and secret. Those will need to belong to a user with a suitable permissions in AWS to create repositories. For my example I have a user assigned to AmazonEC2ContainerRegistryFullAccess. In this post we’ve explored how we can easily use the AWS console and CLI to prepare a repository inside the Amazon Container Registry. This will enable us to push up our images that we will later use within the container service to start up services.